Lots of premieres and other events building up to the third season of Game of Thrones starting the end of this month. A heck of a lot of premieres in the US already; it must get quite boring for the cast. The women must have had to pack a lot of clothes. The actors have mostly been fun and enthusiastic in their many interviews. 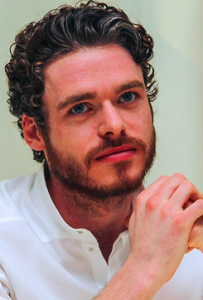 Sophie Turner looks so sophisticated but is still a sweet young girl, Maisie Williams is engaging, I always enjoy Michelle Fairley's interviews and of course, Richard Madden! I've decided to like Oona Chaplin a lot too because she not only declared Richard the best kisser but described him as "the lovely and adorable and wonderful Richard Madden." I'm looking forward to the third series with trepidation because of you-know-what. I don't think I'll be able to watch. I hope you make it through the third series okay, despite the trepidation. Thanks! At least I know what's coming - all those viewers who haven't read the books are in for a horrible shock.